Not getting all of your breaks? Working short staffed or staying late? Feel like you are taking an unsafe patient assignment? Denied earned PTO? Yes, there is something you can do about this. Fill out a Staffing Complaint / Assignment Despite Objection form today. Nurses are standing together for safe staffing and completing a Staffing Complaint/ADO form is the first step. These forms can help make things better NOW and can help gather needed data as we prepare for contract negotiations. You can find the online form at wsna.org/ADO. For any questions, your nurse representative is here to help. Contact WSNA Nurse Rep Sue Dunlap, RN at sdunlap@wsna.org or at 206-575-7979, ext. 3005. We held our third session with our PERC mediator on Thursday, March 8 and we are encouraged that we are seeing some forward movement. Management has indicated willingness to move off of health care and retirement reopeners as part of a package proposal. We are encouraged by this movement, and that management is finally hearing that Skagit nurses expect their health and retirement benefits to be secure during the life of this contract. We are also making some progress on wages, and we continue to push hard for retroactive pay. We also continue to work on safe staffing language and layoff proposals and expect to have significant discussions over these issues during our next session on March 22. We will keep you advised of our progress followings the next session. Contact WSNA Nurse Representative Sue Dunlap at sdunlap@wsna.org for any questions. We had our second mediation session on Thursday, Feb. 28. We had substantive discussions with management on all major issues and we believe that we are making some significant progress, but that we still have much to do. It was clear that the rally had a positive effect on the negotiations as we stressed our concerns to management. We hope to continue to make progress at the next mediation session, scheduled for Thursday, March 7, and will report more after that. For any questions, contact WSNA Nurse Representative Sue Dunlap at sdunlap@wsna.org. Welcome Cheryl Barrie, our new grievance officer! Please join us in welcoming Cheryl Barrie, RN to the local unit officer team. She will be joining us as a grievance officer and she will do a great job representing you and our union. You can reach her at cherylbarrie@gmail.com. At the start of the day, we posted pictures in the negotiations room of our very successful rally. Thank you to all of the nurses who participated in our pre-rally sign making party and to those of you who were able to come to the rally. This was our first mediated session. Mediators work to settle a contract by identifying each sides’ positions on unsettled proposals/issues and looking for a path toward resolving those issues. During our first session, we presented compelling arguments to the mediator in support of our position on unsettled issues. Our proposals would provide Skagit nurses with a stable and predictable work environment that will help retain and recruit nurses. Skagit nurses need safe staffing, better wages, and predictable health care and retirement benefits. Our question now is – why WON’T Skagit management support their nurses and their community? We will return to negotiations with our mediator at the end of February. In the meantime, we must continue to demonstrate unity and solidarity. 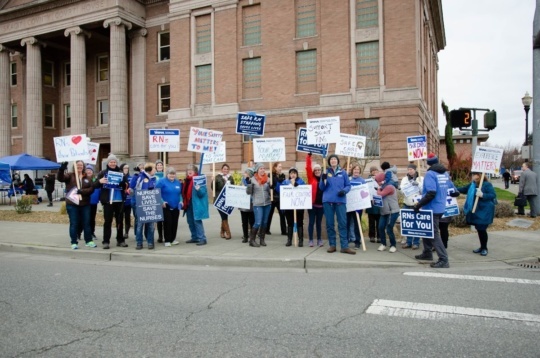 Our rally at the Skagit Courthouse included nurses from our hospital, local firefighters, community members and nurses from Bellingham, Sedro Woolley, Children’s and Kirkland hospitals, demonstrating solidarity and standing united with us in our fight for a fair contract. We must continue to show that we are firm in our convictions and support each other as we continue these negotiations. We must ALL be visible in our support! 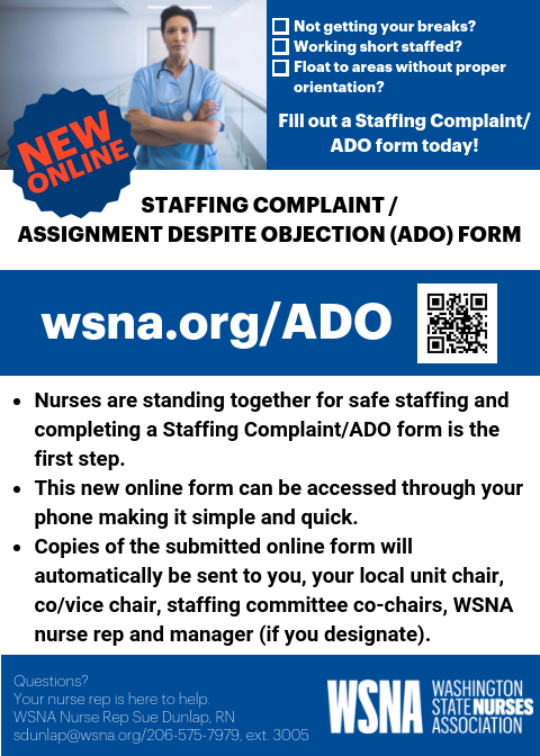 Right now we are asking you for extra diligence in completing the Nurse Staffing Concern (previously ADO) forms to document staffing issues. Fill them out and turn them in to your supervisor and WSNA officers. Please also be in communication with your CAST (contract action support team) members as well as all of us (negotiation team members) with any questions or concerns you may have. Again, a special thank you to all who helped with the rally and a reminder that we will continue to ask you to demonstrate your commitment to the community and each other as we work toward settling a fair contract. Contact WSNA Nurse Representative Sue Dunlap at sdunlalp@wsna.org for any questions. We came, we rallied, we fought. We asked our community to get involved to help us fight for our patients and profession – they delivered! We'd like to extend a thank you to our union brothers and sisters from Mount Vernon Professional Firefighters Local 1983, Camano Island Firefighters Local 4033, Burlington Professional Firefighters Local 4111, IAFF 7th District, LiLuna Local 292, the Washington State Council of Fire Fighters, the Labor-Dem Work Group, Northwest Washington Central Labor Council, the Skagit Democrats, We Do The Work and the 40th Democrats for standing alongside us in the fight for a fair contract. We'd also like to thank our speakers for sharing their experiences and being the voice for all Skagit nurses. Our community is listening. The Skagit Herald covered our rally, read it here. We continue negotiations this Friday, Jan. 25. You can help our efforts at the table to secure safe staffing by filling out nurse staffing concern forms every time you have a staffing concern. If you don’t report it, it is as if it didn’t happen. After filling out the form, email a copy of the completed form to WSNA Chair Liz Rainaud at tulipcityquilt@aol.com and WSNA Nurse Representative Sue Dunlap at sdunlap@wsna.org. Stay tuned for more updates and information! Thank you all for your continued support and congratulations on a successful rally! If you have any questions, contact a negotiation team member, WSNA Nurse Representative Sue O'Donnell atsodonnell@wsna.org or at 206-575-7979, ext. 3045 or WSNA Nurse Representative Sue Dunlap at sdunlap@wsna.org or at 206-575-7979, ext. 3005. We held our 12th negotiation session on Monday, Nov. 26, 2018. We were able to reach a few tentative agreements during this session; however, we are still far apart on the key issues of staffing, wages/benefits, reopeners and layoffs. We have continued to press management on staffing issues, but they have rejected our proposals for specific solutions to help with staffing. We talked about the need for 24-hour IV therapy, additional resource nurses who are not pulled, a designated triage nurse who is not pulled in the ED and the need for meal and rest break coverage. Remember, you can help our efforts at the table to secure safe staffing by filling out nurse staffing concern forms every time you have a staffing concern. If you don’t report it, it is as if it didn’t happen. After filling out the form, email a copy of the completed form to WSNA Chair Liz Rainaud at tulipcityquilt@aol.com and WSNA Nurse Representative Sue Dunlap at sdunlap@wsna.org. Thank you all for your continued support of our negotiating team – we are working hard for you at the table. We have another session scheduled for Jan. 10 and are in the process of scheduling additional dates. Stay tuned for more updates and information. Questions? Contact a negotiation team member, WSNA Nurse Representative Sue O'Donnell at sodonnell@wsna.org or at 206-575-7979, ext. 3045 or WSNA Nurse Representative Sue Dunlap at sdunlap@wsna.org or at 206-575-7979, ext. 3005. We held our eleventh negotiation session on Wednesday, Nov. 14. We reached several tentative agreements in an attempt to move these negotiations forward, but management has not fundamentally changed their positions on issues Skagit nurses care about. In our previous session, we talked about specific solutions to staffing issues related to Resource Nurses, ED Triage Nurses and IV Therapy. During negotiations on Nov. 14, management replied by saying they do not find evidence that a need exists for our proposed solutions. Instead, they proposed supplying WSNA with information, including information related to short staffing, missed breaks, overtime, etc. on a monthly basis for review in Nurse Conference Committee. The information they propose supplying is information WSNA is already entitled to receive. Management’s plan to review these issues in Conference Committee is NOT a substitute for bargaining real, substantive changes to the contract that will help improve safe patient care and alleviate staffing shortages – including the three items we proposed previously. Nurse Conference Committee is an advisory committee only, meaning WSNA is not able to bargain issues that are brought to the committee. And, Conference Committee has not met since early spring 2018. We want our very real safe staffing issues addressed at the table, NOW. We had a lengthy discussion with management about their layoff and restructure proposals. Management continues insisting on reducing nurses’ options and protections in the event of a layoff. Under this proposal, management would have the ability to change nurses’ FTEs, shifts and hours with far fewer options than nurses have now. Management brought a package proposal to the table that does not tie wages to quality metric scores and proposes that your wages would not be reduced if the contract is reopened. BUT – the package continues to contain contract reopeners to your healthcare and retirement benefits. Management isn’t willing to guarantee that those benefits will not be reduced if the contract were to be reopened. Even if your wages are maintained, you would still be making less money if you are paying more for healthcare and having less money going toward your retirement. Thank you to everyone who sent messages to Skagit’s negotiating team by signing “Signs of Solidarity.” We displayed your messages/posters on the walls of the room where we held negotiations. It was a boost for us seeing your messages of support and it was good for management to be reminded that the negotiating team represents all of you - the bargaining unit! STAY TUNED for more information on how you can make your voice heard on our important issues in negotiations! Contact WSNA Nurse Representative Sue O'Donnell at sodonnell@wsna.org for any questions. We had our 10th negotiating session on Tuesday, Oct. 30. During prior sessions, we reached tentative agreements with Management on enhanced sick leave use, charge nurse premium increases, and education premiums. To be clear - it was WSNA who brought those proposals to the table. The support of the bargaining unit has helped us make progress on these issues. Your continued support is essential and appreciated. But there is much more work to be done. Require SRH to maintain staffing levels that enable nurses to meet their responsibilities under the Nurse Practice Act. To date, Management has rejected each and every one of these proposals and has offered no substantive contractual proposal that would address these staffing concerns. Management merely tells us some of the actions it has taken independently, such as hiring traveler nurses into the float pool. These actions are not sufficient to address the issues that we have raised. More importantly, we have told Management that nurses want contractual language regarding staffing and not just promises of what it intends to do. Management is still insisting on reducing nurses’ options and protections in the event of a layoff. Under this proposal, Management would have the ability to change nurses’ FTEs, shifts and hours without following the current layoff procedures which have been in the contract for years. Management’s dangerous proposal would dilute the power of seniority and give us far fewer options than we currently have. The wages for RNs at SRH have lagged behind those of nurses working at nearby WSNA Hospitals for some time now. WSNA has been proposing that SRH increase wages since day one of bargaining to correct the competitive wage disadvantage that Management has insisted upon in past negotiations. Meanwhile, Management is still insisting on tying wage increases to quality metrics goals. If the Hospital doesn’t meet these goals, nurses will not get their full potential wage increases. We can only assume that Management believes that SRH nurses have all the tools and staffing support for the Hospital to meet these goals. Meanwhile, nurses tell us about staffing problems at SRH; and Management refuses to agree to substantive, meaningful approaches to staffing problems. Management fails to recognize that nurses are professionally driven and, that given the proper tools and support, provide exemplary care. Other area WSNA hospitals understand this and do not hold their nurses’ compensation hostage as part of a misguided pay practice. They guarantee full wage increases for the life of their contracts all the while facing similar Medicare and Medicaid reimbursement constraints as SRH. We fear that Management’s dangerous new approach to compensation will give SRH nurses yet another reason to look elsewhere for employment. Moreover, Management has recently insisted on the ability to try to reduce your wages during the life of the contract. That’s right. In addition to wanting the ability to try to reduce your medical and retirement benefits during the life of the contract, Management now wants a crack at your wages. Finally, Management has communicated to you that it wants to complete contract negotiations soon so that you can get raises. What Management chose not to tell you is that they have proposed that any wage increase will not be effective until the contract has been ratified. Since day one of bargaining, WSNA has proposed that wage increases will be effective from the expiration date of the current contract. Management’s proposal is nothing but a strong-arm tactic to pressure nurses to accept a sub-standard contract. WSNA has been ready and willing to bargain all issues throughout negotiations, including medical and retirement benefits. Meanwhile, Management tells us that it needs more time to figure out what it wants to do with medical and retirement benefits. Nurses’ timely wage increases should not be held hostage because of Management’s lack of preparation for these negotiations. Our next sessions are scheduled for November 14 and 26. Thanks to All of you who attended the Board Meeting on October 26. Nurses delivered a powerful message to members of the Board. for more information on how you can make your voice heard in these negotiations! Attend the Skagit Regional Health Board meeting THIS Friday, Oct. 26! Plan now to attend the Board of Directors meeting this Friday, Oct. 26 at 7:50 a.m. in the Sahale Room at the hospital. We want a show of nurses. The Board needs to see that management is still not taking our proposals and demands seriously. 7-9 a.m.: Drop-in Q&A in the cafeteria with members of the negotiation team before or after the show of support at the board meeting. Negotiation update: Our ninth negotiating session took place on Thursday, Oct. 18. We have reached tentative agreements on enhanced sick leave use, charge nurse premium increases and education premiums. But we are still apart on safe staffing, retirement and insurance, wages and layoff language. Management continues to resist our proposals on safe staffing, breaks and our need to know what health care and retirement benefits to expect over the life of this contract. They are still proposing to condition some of our wage increases on metric scores. In response to our staffing and break concerns, management is bringing proposed solutions that they want to implement without meaningful nurse input. They are not including us in these decisions. These are issues that should be addressed by exchanging proposals at the table, not by bringing processes management is trying without our meaningful input. Along with safe staffing and breaks, we have other substantive issues on the table. Management wants to drastically reduce our rights in the event of a layoff. Over the past several years, approximately one dozen departments have been affected by layoff and restructure. Layoff is real. Limiting our options is not what we as nurses want. Tell management that we, your negotiating team, are here to bargain a contract now. We were at the table in 2017 and agreed to a one year contract in part because management didn’t have a proposal for us regarding healthcare and retirement benefits. They are telling us they still can’t give us these. They have had more than a year to get this together. They need to bring these items to the table and bargain them now. We are interested in bargaining a fair, comprehensive contract now. Our next negotiating session is scheduled for Oct. 30. Watch for further actions to come. Our ninth contract negotiation session, scheduled for Oct. 5, was canceled. Our next bargaining session is scheduled for Thursday, Oct. 18. We are asking for all Skagit RNs to help us gather data for our staffing proposal by completing the Safe Staffing and Workplace Violence Survey today. Tuesday, Oct. 16, 5:30-6:30 p.m. Questions? Contact WSNA Nurse Organizer Sydne James, 206-575-7979 x3004. On Sept. 28, Skagit nurses packed the room at the board of commissioners meeting to hear four of their colleagues give testimony: Bruce Cornwall, RN, PCC, Cammie Rome, RN, CCU, Patricia Rhinevault, RN, ED and Kyla Malean, RN, OR. This is how we demonstrate power at the contract bargaining table. Contract bargaining session 9 will be Friday, Oct. 5. Visit the WSNA table in the cafeteria on Oct. 5 from 11 a.m. to 2 p.m. to learn more, get involved and to help win at the table. Questions? Contact WSNA Nurse Organizer Sydne James at sjames@wsna.org. SRH Nurses: Are you safe at work? Workplace violence and inadequate staffing are not acceptable! Together, we can and must make SRH a safe place for nurses, colleagues and our patients. Nurses at SRH shouldn’t be afraid when they go to work. Even so, nurses are fearful of some of the very patients for whom they care. Some of us have been victims or have witnessed violence in our workplace. Please take a few minutes to fill out our Workplace Violence & Safe Staffing survey. Your personal information will be kept confidential. Support them by packing the room with Skagit nurses! Showing up tells the Board and administration that you support the WSNA contract negotiation team. Questions? Call WSNA at (206) 471-2687. We spent a majority of the day talking about staffing issues and how to make the staffing committee more effective. Management provided its perspective on staffing and acknowledged that there is often a bottleneck due to the boarding of patients in the ED because of insufficient resources to transfer patients out of the ED and staffing issues house-wide. Management still insists on tying wage increases to quality metrics goals. Likewise, they are still maintaining their proposal to be able to try to reduce health and retirement benefits during the life of the contract. 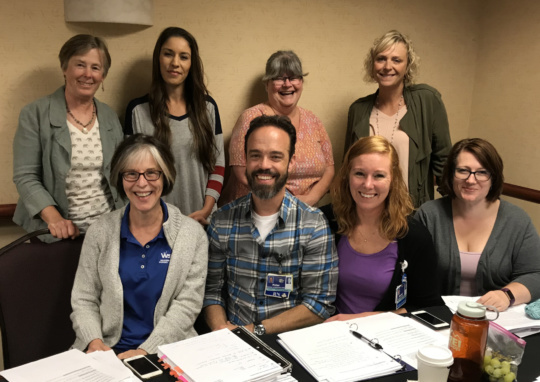 As your WSNA RN negotiation team, we continue to press SRH that we are here to bargain wages and benefits now and that the way to improve patient care and nursing safety and morale is to implement real improvements to our staffing. We have a plan to win at the bargaining table and it involves all of us. We need to show SRH that an overwhelming majority of nurses support our negotiation team. That is how we demonstrate power at the bargaining table and how we will get the best contract. 404 S 3rd St, Mt Vernon, WA 98273. Pack the room at the next hospital board of commissioners meeting, Friday, Sept. 28 from 8 – 8:15 a.m., in the Sahale conference room at the hospital. Nurses will be speaking to the board about issues of safety, staffing and support. Fill out Staffing Concern Forms every time there are staffing concerns, including missed breaks. Donate annual leave to the nurses on the negotiating team. The bargaining sessions are unpaid time for us and your donations show management that you value our time. Download a form and return it completed to any negotiating team member or mail it to WSNA. Questions? Contact any of us or WSNA at 206-575-7979, ext. 0. We did not achieve any tentative agreements. Our team came prepared to discuss staffing to help management fully understand what staff nurses are facing in their work every day. We came with real stories as well as Staffing Concern Forms. We wanted them to recognize how our proposals will improve patient care by addressing significant staffing shortcomings. We were shocked when management told us they feel that hearing the nurses concerns would not be productive since they had already come up with a remedy for the Emergency Department. Management told us that they would increase the float pool by 4.8 FTEs to address staffing issues in the ED. After a great deal of pressing by WSNA, management listened to the negotiating team nurses tell what has been reported to them by their colleagues. They told of understaffing that prevented nurses from getting rest breaks and meal periods in the ED as well as the med/surg units, the need for the triage nurse to be reinstated in the ED and the need for STAT nurses for the house. They also shared information from Staffing Concern Forms which also revealed inadequate staffing. Your negotiating team is continuing to press hard to get real long-term improvements to our staffing, but we cannot do this alone. We need your help! Fill out Staffing Concern Forms every time there are staffing concerns including missed breaks. Put car signs in your cars; share them broadly with community members and businesses so they can post them in support of the nurses too. Donate Annual Leave to the nurses on the negotiating team. They are doing this important work on unpaid time for you, the patients and the community. You can get an Annual Leave Donation form from your negotiating team members or download a form to print yourself. Then return the form to a negotiating team member or mail it to WSNA. Management continues to present proposals that benefit them and that are bad news for us. Their latest unsavory proposal is called “Reallocation.” Under this proposal, management would have the ability to change nurses’ FTEs, shifts and hours without following the current layoff procedures which have been in the contract for years. Management’s dangerous proposal would dilute the power of our seniority and give us far fewer options than we currently have. There are other proposals that they have made that are not good for nurses. Meanwhile, management is proposing an uncompetitive 1.25% across-the-board wage increase in each year of the contract, and conditions a further one-time .75% wage increase in 2019 upon whether the hospital meets quality metrics goals regarding nurse communications. If the hospital doesn’t meet these goals, nurses will not get their full potential wage increases. We can only assume that management believes that SRH nurses have all the tools and staffing support for the Hospital to meet these goals. Meanwhile, nurses tell us about staffing problems at SRH; and management refuses agree to substantive, meaningful approaches to staffing problems. Management fails to recognize that nurses are professionally driven and, that given the proper tools and support, provide exemplary care. Area WSNA hospitals understand this and do not hold their nurses’ compensation hostage as part of a misguided pay practice. They guarantee full wage increases for the life of their contracts, all the while facing similar Medicare and Medicaid reimbursement constraints as SRH. We fear that management’s dangerous new approach to compensation will give SRH nurses yet another reason to look elsewhere for employment where they can earn a better wage and count on guaranteed wage increases that are higher than what management is proposing. Management is still proposing that they be permitted to try to reduce your health and retirement benefits during the life of the agreement, if it so desires. Management has rejected our proposal to improve health and to preserve retirement benefits. Charge nurse premium: We proposed to increase this from $2 to $2.50. OT on holidays: We proposed double time for OT on a holiday. Education time: We proposed to increase this from 24 hours to 40 hours. Staffing: We can only assume that, rather than meaningfully engaging WSNA on substantive staffing and resource solutions, management believes that the solution to improving quality metric benchmarks is to have nurses work harder so that they can realize the full value of a potential wage increase without a corresponding commitment by management to ensure that nurses have the proper staffing and resources to provide excellent care. We believe there is a better approach and have proposed staffing language so that the level of care can be improved. Maintain staffing levels that enable nurses to meet their responsibilities under the Nurse Practice Act. How does management expect nurses to help them meet their goals when they refuse to agree to staff so that nurses provide safe patient care or so that they can receive meal and rest breaks? They won’t even agree to abide by the staffing matrix. The next time you are working short-staffed, ask yourself what management is doing for you to help them meet goals relating to nurses’ communication with patients and their families. After all, under management’s proposal, your patient’s quality of care and your paycheck will depend on it. Make no mistake about it, management is proposing sweeping, fundamental and disturbing changes to your contract that we believe will be bad for nursing and bad for patients. Now more than ever, it is important that all nurses be informed about these issues and to join us in our defense of nursing at SRH. Call Sydne James at 206-575-7979, ext. 3004 or email sjames@wsna.org to RSVP. United we stand; divided we beg. If you are unable to attend the meeting but would like to get more involved in helping our team get the best contract for all the Skagit RNs, contact any bargaining team member or your WSNA nurse representative, Sue O'Donnell (sodonnell@wsna.org). We are hearing a lot of good questions from nurses about what is happening in negotiations and we are excited that so many of you are interested in what is going on at the bargaining table. One of the things that we want you to know is that the work we do in negotiations is different than a fast-paced shift on the floor or in a clinic. Work at the bargaining table is often times slow and methodical. Consequently, we may not have a lot of “new news” after each session. We are working hard right now to fight off proposals from management that will not benefit Skagit RNs. These include management’s continued push to be able to reopen the contract and renegotiate our healthcare and retirement benefits. Think renegotiate = reduce! And at our latest session, management proposed tying an even greater percentage of wages to “designated quality metric benchmarks.” We are not fooled by any suggestion that this is good for nurses. We need a guarantee of adequate staffing, a safe patient care environment and appropriate support in order to be able to deliver quality patient care. Along with fighting off management’s repugnant proposals, we continue to push our agenda for safe staffing during these negotiations. We are working hard on the behalf of all WSNA represented Skagit nurses. Right now, Skagit nurses need to stay informed, involved and visible as we work for a fair contract. We need to send the message to management that we are united and that we will fight to maintain our benefits and to get a fair contract now! Understand that we will get the best contract if a majority of Skagit RNs show support for the WSNA contract bargaining team. There are many ways to show your support. Keep reading to find out how! July 30 – our next negotiation session Stop by Skagit cafeteria on July 30 from 11 a.m. to 2 p.m. to talk with WSNA Organizer Ione Fullerton. Aug. 2 – a local unit meeting Drop-in from 5 to 8 p.m., Sahale Room, Skagit Hospital. Attend to get updates from the July 30 negotiation session, have your questions answered, learn more about your contract benefits, find out how to get more involved and get tips on how to use the Nurse Staffing Concern forms to affect change. Speaking of staffing... mark your calendar for a free CE event! Aug. 15 - WSNA Executive Director Sally Watkins will give a presentation on the new state staffing law. This event includes 2 CEUs and a free dinner. All Skagit RNs in the bargaining unit who are interested in learning more about improving our staffing concerns should attend. If we don’t understand the law, and our rights around the law, how can we stand up for ourselves and make things better? Seating is limited, so RSVP today by contacting WSNA Nurse Organizer Sydney James at 206-575-7979, ext. 3004 or at SJames@wsna.org. For any questions, contact WSNA Nurse Representative Sue O'Donnell at sodonnell@wsna.org. We met with management for our 4th contract negotiation session on June 21. We continued to address issues around Safety, Staffing, and Support during that session. Nurses are showing a lot of interest in these contract negotiations – and we need your continued interest and support. We will be looking to you, WSNA represented RNs, to help us get your messages to management as we work to get the best contract possible. One of the issues we are addressing is adequate staffing related to meal and rest breaks. You are entitled to two 15-minute breaks in an 8-hour shift and three 15-minute breaks in a 12-hour shift. Are you getting all of your 15 minute breaks? Let us know – email Sue O’Donnell Nurse Representative at sodonnell@wsna.org. We had a great turnout at our Local Unit Meeting on June 12. Thanks to those who were able to attend. And thanks to the nurses who have contacted us with your questions and comments. We will be holding additional meetings as negotiations progress and will keep you informed of when and where these will happen. Our next negotiation session is scheduled for July 24 and additional sessions are scheduled in July and August. We have a lot of work ahead of us. We will get a fair contract by standing together to promote the welfare of our patients and our professional integrity. Ask your negotiating team members how you can support us in having our voices heard and getting that work done! complete the Nurse Staffing Concern Form. The third contract bargaining session was on Tuesday, June 5. We have been trying to set a tone in these negotiations that will facilitate an open dialogue between WSNA and Skagit management. While we have reached tentative agreements on several minor issues, we are a long way from agreement on major issues including safe staffing, rest and meal breaks and economics. This week, we spent time explaining to management why nurses need to be able to take their meal and rest breaks without compromising patient care. We hope management heard our concerns and will act on those concerns. What is also concerning is management's proposal to potentially reopen the contract and renegotiate healthcare and retirement benefits during the life of the contract. We are here to bargain these issues now. We all have a role in these negotiations. If we are going to get the best contract possible, we need to show Skagit that we stand in solidarity and that all the Skagit nurses are in support of the negotiation team. Wear a WSNA button every shift. This is how we show support and solidarity. Clock and report all missed breaks. We are telling them this is an important issue. If you don’t report it, they believe it’s not important to you. Attend the drop-in meeting on Tuesday, June 12 from 4:30 p.m. - 8 p.m. at Round Table Pizza (115 E College Way). * For those who are unable to attend the drop-in meeting, contact WSNA Nurse Organizer Sydne James at 206-575-7979, ext. 3004 to find out what you missed and how you can help. They want to wear us down. We will wear THEM down! We have given them our proposals on staffing, education, premiums and wages. Your WSNA negotiation team met with Skagit Regional Health administration for our second contract bargaining session on Wednesday, May 30. Administration has made proposals that jeopardize the security of our retirement and health benefits. We have our work cut out for us - let’s show them that we are up to this! Wear a WSNA button every day you are at work. A WSNA member will hand you a “cheat sheet” before you speak to him so we are all saying the same message in support of our contract negotiations. Mark your calendar for a drop-in style WSNA meeting on June 12 from 4:30 - 8 p.m. at Round Table Pizza in Mt Vernon. 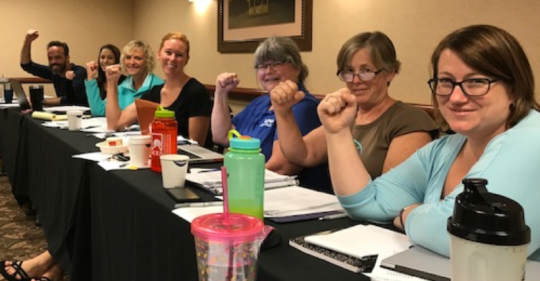 Your WSNA RN bargaining team wants to meet with you! Talk about negotiations while you are at work and on break. The breakroom is always a safe place for this. We want our managers to know that nurses are talking about contract negotiations. Our next contract bargaining session is Tuesday, June 5. Stop by the WSNA table that day from 11 a.m. - 3 p.m. to get “real time” updates from WSNA organizers. This is also a great way to get buttons, to share issues and to find out how YOU can help us all get the best contract. For questions, contact a member of your bargaining team or WSNA Nurse Representative Sue O'Donnell at sodonnell@wsna.org or at (206) 575-7979, ext. 3045. By completing the staffing Concern Form, you are helping to make the problem known to management, which creates an opportunity for the problem to be addressed. Additionally, you are documenting the facts, which may be helpful to you later if there is a negative outcome due to the concerns that you identify. Share comments, ask questions, hear the survey results and eat pizza. When: Tuesday, March 6, 2018, 5 - 8 p.m. If you have any questions, please call Sue O’Donnell, WSNA Nurse Representative at (206) 575-7979, ext. 3045 or via email at sodonnell@wsna.org. WSNA met with management on Monday, Feb. 19. As of today most, but not all, potentially affected nurses have been notified that their department is included in layoff/restructure. Nurses in Case Management, Oncology, Women’s Health Clinic, Nephrology Clinic and Rheumatology Clinic have been notified they are affected. As of Feb. 19, management had not notified the least senior nurses who may be affected. These least senior nurses comprise the Low Seniority Roster. The Low Seniority Roster for this layoff/restructure include RNs working in Clinical Care Group C, who were hired since January 2018. WSNA will be reaching out to these nurses beginning today. See the CBA, page 37, for definition of Clinical Group C.
WSNA continues to represent your interests as we work with management and move through this layoff/restructure. If you have questions/concerns please contact Sue O’Donnell, WSNA Nurse Representative, at (206)575-7979, ext. 3045 or sodonnell@wsna.org. Preparations for WSNA contract negotiations are underway! The negotiation survey will be available until Friday, Feb. 23. Update your contact information with the WSNA Membership Department at membership@wsna.org or by phone at (206) 575-7979. Consider becoming a unit representative. Consider becoming a member of the negotiating team – we cannot represent your interests unless we have nurses from various units at the negotiating table. Continue to watch your Skagit homepage and your email for updates and information. Questions? Contact WSNA Nurse Representative Sue O’Donnell at (206)575-7979, ext. 3045. We want you to know that we are aware of this situation and are working to protect the interests of SRH/WSNA represented registered nurses. Your collective bargaining agreement provides a specific process in layoff/restructure that will be followed. When we have more information about the potentially affected departments/nurses we will be back in contact with you. Sue O’Donnell, WSNA Nurse Representative at (206)575-7979, ext. 3045 or via email at sodonnell@wsna.org. The Contract has been ratified! Skagit nurses voted overwhelmingly on Friday to approve the contract. Thanks to all of you who voted! Remember – now is the time to get involved with WSNA. We are taking nominations for Officer positions/Executive team. Fill out your nomination form and return it to WSNA ASAP. Nomination forms need to be postmarked by July 12th. Questions? Please contact Sue O’Donnell, WSNA Nurse Representative at 206-575-7979, ext. 3045 or sodonnell@wsna.org. Your Negotiating Team is recommending a “YES” vote. This is also your chance to get updated and involved! Members of the Negotiating Team and WSNA Attorney will be available to answer your questions about the contract during these times. You will also receive a WSNA Local Unit Officer Nomination form and return envelope in the mail. Nomination forms must be postmarked back to WSNA by July 12, 2017. Only active members are eligible to vote and hold office. If you are not sure of your membership status, please contact membership at membership@wsna.org. Now is a great time to become active in WSNA! 2% wage increase beginning July 3rd, 2017 and another 2% increase on the first pay period after March 1, 2018. These wage increases are in addition to the “step” increases you already receive. We heard your concerns about needing guaranteed pay and successfully fought off Management’s proposal to tie RN wages to Value Based Purchasing scores. Improvements and clarifications re: Hospice RNs’ working conditions. A more detailed summary will be posted shortly. Your Negotiating Team members and WSNA Attorney/Lead Negotiator will be available during the vote meetings to answer your questions prior to you casting your vote. Questions? Contact WSNA Nurse Representative, Sue O’Donnell at sodonnell@wsna.org or call 206-575-7979 ext 3045. We held our sixth negotiation session on 5/31/2017. We stressed the importance of predictability of wages and benefits to Management. Management offered to extend the contract for one year - which would include a wage increase and a few other enhancements to the contract - and to bargain another contract a year from now. However, they continue to propose tying a component of nurses’ compensation to value based purchasing scores. We want to hear from you and share our thoughts with you about these negotiations. We are holding Drop-In Local Unit Meetings. Plan to attend! The Good News: We made some progress in Session 5 around WSNA’s proposals for improved nurse training and preceptorships. The Reality Check: We are still far apart on several important issues including wages, benefits and staffing. Management is not hearing that nurses want a contract that provides certainty. Nurses do not want their benefits to be further eroded. Nurses do not want their pay tied to value based purchasing scores. Management is still insisting that they be allowed to try to reduce your medical benefits during the life of the contract. We are in negotiations now – to negotiate a complete contract now. Our next Session is 5/31/2017. We will keep you posted on our next steps. retirement prior to the end of the contract. This creates an uncertainty for all. We had robust conversations around the issues of residency and preceptorship. Our team is providing their expertise to show how important a well-implemented residency can benefit SRH. Today was productive. We reached agreement on an ADDITIONAL specialty premium. Our team worked diligently to negotiate a plan to kick off a new and improved RN Conference Committee in the coming months. This will enhance our ability to address issues as they come up. Staying informed. Send your updated contact info to WSNA at membership@wsna.org. Talking to our team members as you see them throughout the facility in the coming days/weeks. WEARING YOUR BUTTONS: Our team members will be working hard to distribute them soon! Questions? Contact WSNA Nurse Representative Sue O’Donnell at sodonnell@wsna.org or call 206-575-7979, Ext 3045. Your fellow nurses on your WSNA bargaining team met with Management for the 3rd time on April 25th. Management shared with you a few of its proposals that it made during our last session. We would like to give you our perspective. Management is proposing that nurses settle for uncertainty. Uncertainty with respect to wages, uncertainty with respect to healthcare benefits, and uncertainty with respect to retirement. Management is proposing that there be no guarantee of any wage increase in the third year of the contract and that it be allowed to try to reduce medical and retirement benefits during the life of the contract! Moreover, just as it did in 2014, Management is once again proposing that some of nurses’ compensation be tied to the Value Based Purchasing scores set by the Centers for Medicare and Medicaid Services (CMS). Nurses at SRH are professionally driven and, given the proper tools and support, provide exemplary care. Area WSNA hospitals understand this and do not hold its nurses’ compensation hostage as part of a misguided pay practice. They guarantee full wage increases for the life of their contracts all the while facing similar Medicare and Medicaid reimbursement constraints as SRH. WSNA has made proposals that provide for guaranteed, competitive wage increases throughout the life of the contract and that protect insurance and retirement benefits for the life of the contract. We have also made proposals that address staffing issues and ensure that nurses receive proper training and support. Our next bargaining session is May 19th. Stay tuned for our National Nurses Week (May 6-12) event details coming soon! 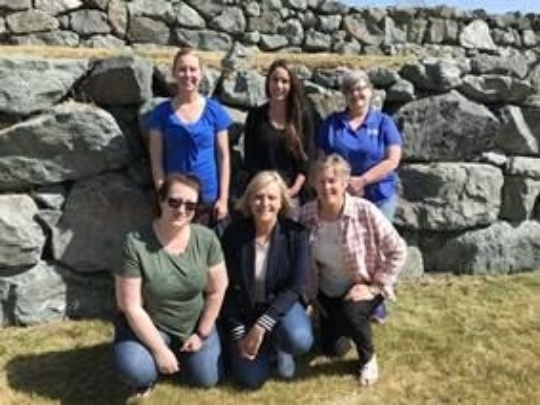 In Solidarity, Liz Rainaud MSN, RNC – Family Birth Center April Torrey RN, OCN – Oncology Jonathan Fritz RN – CCU Randi Dykstra BSN, RN – Case Management Melissa Perez RN – MPC Kim Thornton BSN, RN – MOC Doug Robinson CHPN, RN – Hospice Brittany Holley RN – Family Birth Center Questions? Contact WSNA Nurse Representative, Sue O’Donnell at sodonnell@wsna.org or call 206-575-7979 ext 3045. Our WSNA nurse negotiation team met with administration today for our second session. Administration presented part of their proposal with the notable exception of their financial proposal. Management suggested they will have their financial proposal for us to review at our next session. Our team is committed to ensuring RNs receive the training needed to deliver high quality care to our patients. The team also pressed management to make sure RNs have full protections in a layoff or if we develop our skills by transferring to a new specialty area. Our team is acting on behalf of the interests of the entire bargaining unit but we cannot do this FOR you. 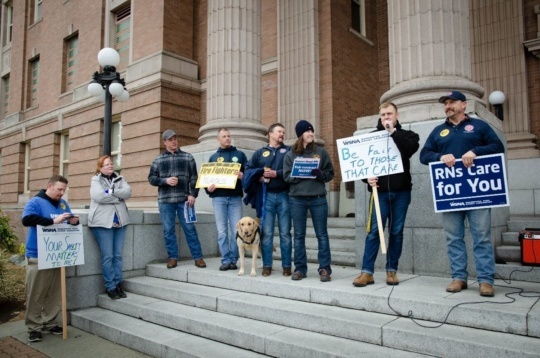 It is crucial that every RN at Skagit plays their part in the successful achievement of a fair contract. Talk to each other about the communications our team puts out after each session. Communicate with our team and WSNA about your ideas and concerns. When we ask for your input, take the 5 minutes to answer our questions. Make sure your personal email is up to date to stay in the loop! Send to membership@wsna.org. Our WSNA nurse negotiation team met with administration today for our first session. Administration plans to respond and present their proposal next week. They began the conversation stressing their financial constraints. To shore up our communications network, our team needs to know how to reach you! If you are receiving our emails from wsna.org, then you’re good. If not, please email membership@wsna.org with your updated personal home/cell phone and personal email address. We’re also looking for a few people on each unit and shift to act as our point of contact. If you’re willing to act in that role for these negotiations, please let us know by emailing Sue O'Donnell at sodonnell@wsna.org. You can also get valuable information on our WSNA website. We are your negotiating team. Your Officers and Negotiating Team need to hear from you as we plan for upcoming Contract Negotiations! Join us at a Drop-In Local Unit Meeting Tuesday, March 7, 2017. Questions? Contact Sue O’Donnell, WSNA Nurse Representative @ 206-575-7979, ext. 3045 or sodonnell@wsna.org. 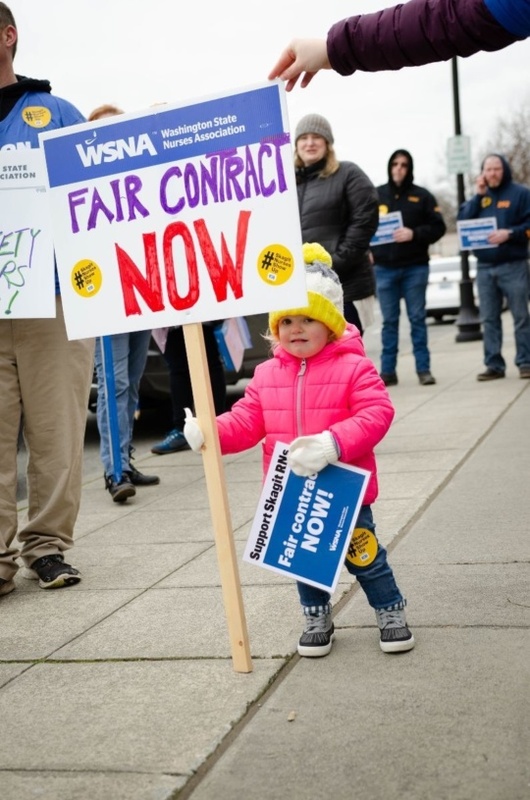 ​Preparations for WSNA Contract Negotiations Are Underway! Your WSNA Local Unit Officers and Leadership Team are preparing for contract negotiations. Your input and participation are vital in getting the best possible contract for Skagit RNs. Here’s how you can be involved. We need to hear from ALL of the Nurses at Skagit. Please take this survey now. The survey will be available until January 11th. Update your contact information with the WSNA Membership Department at membership@wsna.org or by phone at 206-575-7979. Consider becoming a member of the Negotiating Team – We cannot represent your interests if someone from your unit is not there at the negotiating table. Questions? Contact Sue O’Donnell, WSNA Nurse Representative @ 206-575-7979, ext. 3045. The 2016 WSNA Union Leadership Conference in beautiful Lake Chelan is scheduled for Sept 25-27. Nurses from across the state will convene to get an update on the national and state labor scenes, to learn how to be more effective leaders in our own workplaces, to celebrate our successes and to strategize for what’s coming next. WSNA will be entering contract negotiations with Skagit Regional Health soon. This conference will energize you, educate you, and make you a more effective participant in your profession and your union. Who knows - you may even be inspired to join the Contract Negotiating Team! Last year, attendees received up to 7 CEUs for attending workshops and presentations. Your Local Unit Officers are sponsoring 3 Skagit nurses to attend the conference. You are eligible if you are a WSNA member. The sponsorships will cover registration costs and reimbursement of hotel costs and mileage. Contact one of your Local Unit Officers or your WSNA Nurse Representative Sue O’Donnell sodonnell@wsna.org for more information or to reserve your spot at this event. Sorry for phone message Sunday evening saying it is December 14th – A second phone message was sent with the right date. Please call 206-575-7979, ext. 3045 if you have any questions. When nurses speak, we all win! Don't miss this upcoming event. This is your opportunity to meet with district legislators and describe a day in the life of a nursing professional, the challenges and highlights. Send a clear message that nurses are passionate about quality care and patient safety and are speaking up. Changes in Your Working Conditions, Wages, and Hours of Work are Protected By Your Contract! 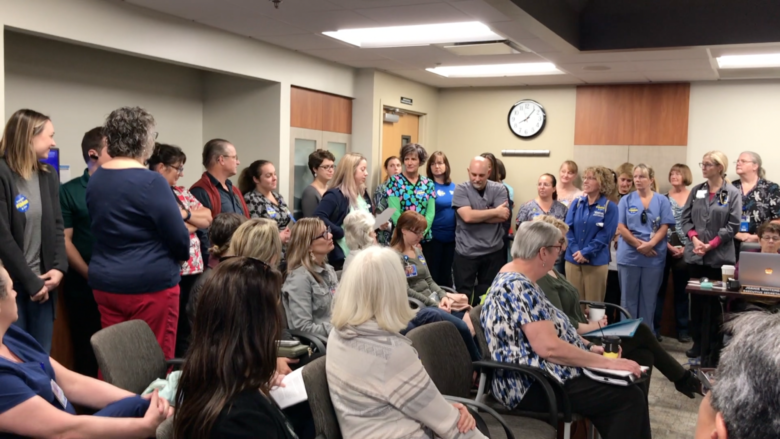 It has come to the attention of your WSNA leaders at Skagit Regional Health that Skagit Management proposed changes in the oncology clinic that may have resulted in the Reduction of FTEs and the Elimination of at least one position. Members informed us that management requested that these clinic RNs agree to a voluntary restructure of their FTEs and hours. Some of the Nurses were NOT in agreement – and knew to notify WSNA before agreeing to any changes. Your Collective Bargaining Agreement [contract] protects you in layoffs. It has a clearly defined process in place agreed on by Skagit RNs and Management. Skagit Nurses – Come celebrate our recently ratified contract and the power of pulling together to get things done! Food and non-alcoholic beverages will be provided. Your 2014-2017 Contract is now available to download. CDs will not be sent. You can download a copy of the Contract onto all of your personal electronic devices that have PDF capabilities: Laptop, Desktop, Tablet, and Smartphone. If you have any questions or are in need of a printed copy, please contact WSNA at 1-800-231-8482 or via email at wsna@wsna.org. Please join me in welcoming Sue O’Donnell as your new WSNA Nurse Representative! I have enjoyed working with all of you! 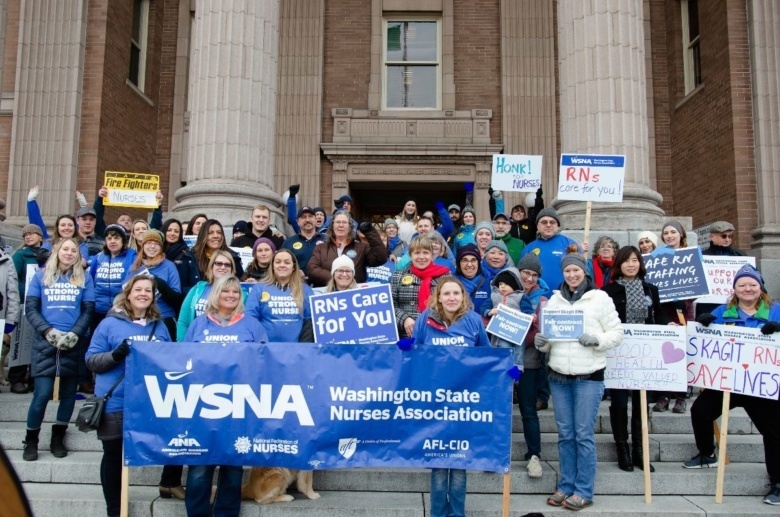 On March 17th, 2015, Skagit Registered Nurses approved the new contract. Thanks to ALL of you who worked so hard and stood strong during negotiations. By standing together we were able to show SRH management that we are dedicated professionals who demand that our voices be heard. Again - THANKS TO ALL OF YOU!!! The contract will be available soon. We will notify you when it is available. If you have any questions, please contact your Local Unit Officers or Nurse Representatives. Your Bargaining Team Recommends a "YES" Vote! We Thank The Nurses At Skagit Regional Health For Standing Up And Supporting Your Bargaining Team So That We Could Achieve A Fair Contract After 19 Hard-Fought Bargaining Sessions. TERM: Contract will expire on May 31, 2017. 12/8/14: Retain base wage increases to Acute Care (4%), Hospice (4%) and Clinic (8%). Ratification Date: Effective first full pay period after ratification all Urgent Care Nurses (current and newly hired) will be paid at the Acute Care wage rates, and the $4.00/hr. premium will cease. 6/1/15: All nurses receive a 2.0% base wage increase. Plus, all non-urgent care clinic nurses (current and newly hired) will be paid at 95% of the Acute Care wage rates. 6/1/16: All nurses receive a 2.0% base wage increase. Plus, all non-urgent care clinic nurses (current and newly hired) will be paid at 100% of the Acute Care wage rates. Signing Bonus: After ratification of the Agreement, nurses will receive a payment of $1,000 for a 1.0 FTE, prorated by FTE, with a minimum payment of $200. Per Diems shall receive $200. Through this wage agreement, we accomplished the important goal of securing good wage increases for all nurses and having all nurses at SRH on the same wage scale by next year. We secured a signing bonus to help offset the delay of the first wage increase. We also completely fought off Management’s dangerous proposal to condition wage increases on the Hospital meeting certain goals. BSN Premium: Increased from $1.00 to $1.50 per hour. Retirement Plan: New language requiring the Hospital to maintain its level of matching contributions for the life of the Agreement. Conference Committee: WSNA can now have 5 members on the Committee, instead of 3, including the WSNA Nursing Representative. Other individuals may attend with the agreement of the Hospital and WSNA. New language requiring more frequent meetings in 2015 than was required by contract before. Low Census: New language stating that volunteers will be low censused before those nurses working overtime. Information Requests by WSNA: We removed language from the contract that limited WSNA’s access to Employer information only to when there was a filed grievance or when it was related to the bargaining process. Training Positions: New language stating that the Hospital may post training positions in IV Therapy, Oncology and Hospice. Floating: New language stating that no nurse will be required to float more than twice per shift. Association Access to Premises: New language requiring the Hospital to designate a contact person for WSNA to notify when accessing the premises. Work Day: New language clarifying that the normal work day is either 8, 10 or 12 hours and that any change from an individual nurse’s normal work day to another normal work day and any change to a nurse’s starting or end time must have the mutual agreement of the nurse. If the Hospital wishes to change from one normal work day to another normal work day for a whole unit, the Hospital must use the layoff process which gives nurses bumping rights within the unit and outside the unit based on seniority. Clinical Care Groups: The groups have been clarified to clearly show the bumping rights that each nurse has in the event of a layoff. Recognition for Previous Experience: New language ensuring that newly hired acute care nurses get full credit for previous acute care experience, that newly hired hospice nurses get full credit for hospice experience and that newly hired clinic nurses get full credit for previous clinic experience. New language also clarifying the credit a nurse would receive for experience in a different care setting than the setting into which he or she is hired. Staffing: New language requiring that the Hospital maintain a staffing committee, that WSNA determine how the nurse members of the committee are selected and that nurses attending the meetings are on paid time. Also, we have developed a Nurse Staffing Concern Form that will be attached to the contract and will require the Hospital to state what measures were taken in response to nurses’ staffing concerns. Hospice Nurses: New language stating that all nurses, not just per diems, will be oriented to telepage duties and procedures and that nurses who are regularly scheduled to work weekends cannot be forced to take relief telepage duty on a weekend, but can request to work it, if agreeable to the Employer. Skagit Regional Clinic Nurses: New language clarifying that clinic nurses receive an unpaid meal period of one hour and that nurses required to work during the meal period shall be compensated for such work at the appropriate rate. Pay for Performance. Management proposed to condition some of the nurses’ future wage increases on the Hospital meeting certain goals relating to: whether patients would recommend the Hospital; communication with nurses; responsiveness of hospital staff; and pain management. WE SUCCESSFULLY FOUGHT OFF THIS PROPOSAL. Nurses’ wages are guaranteed as they are at other area Hospitals. Per Diem and Premium in Lieu of Benefits Reduction: Management proposed to reduce the premiums from 15% to 10%. WE SUCCESSFULLY FOUGHT OFF THIS PROPOSAL. Work Day: Management also proposed that a 6-hour shift be considered a “normal” shift and that Management be allowed to change the start and end time of a nurse’s shift without the nurse’s consent. WE SUCCESSFULLY FOUGHT OFF THIS PROPOSAL. Grievance Procedure: Management proposed to restrict WSNA’s ability to choose who can represent nurses during grievance hearings. WE SUCCESSFULLY FOUGHT OFF THIS PROPOSAL. Access to Premises: Management proposed to put additional burdens on WSNA before we can access the premises. WE SUCCESSFULLY FOUGHT OFF THIS PROPOSAL. Job Posting: Management proposed that nurses with written disciplines within the last 12 months would not receive consideration when applying for a job. WE SUCCESSFULLY FOUGHT OFF THIS PROPOSAL. Bereavement Leave: Management proposed to reduce the amount of bereavement leave. WE SUCCESSFULLY FOUGHT OFF THIS PROPOSAL. We have a Tentative Agreement! Come and Vote Mar 17th! We have a Tentative Agreement! Contract summary to follow next week. Ratification Vote: Tuesday, March 17, 2015. Come to one of the times listed below to cast your ballot. A summary, a red-line of the contract, your negotiating team, and the WSNA negotiating attorney will be available at the vote. Must be present and a member in good standing to be eligible to vote. Your negotiating team worked hard to get you a fair contract! Please consider donations of Annual Leave or Cash for your Negotiating Team who volunteered hundreds of hours of their time! Give your donations to one of the negotiating team members listed below, mail it to WSNA, or bring it to the ratification vote. Make checks payable to WSNA and write Skagit Negotiating Team on the memo line. You can get an Annual Leave donation form from any of the negotiating team members, and forms will also be available at the vote. !! Successful Action – Thank You – Successful Action !! Thank you to everyone who attended the “Show of Solidarity.” It was very helpful, energizing and fun! We completed our 18th session of negotiations and are scheduled to meet again this Sunday, March 1, 2015. Now is the time to take action and show your support! From 11:00 a.m. to 12:00 p.m. Thank you to everyone who attended the last series of Local Unit meetings. It was very helpful to hear your thoughts, concerns, and ideas. We have taken your feedback into consideration in planning our next steps. Our 18th session of negotiations is scheduled for February 25, 2015. YOUR NEGOTIATING TEAM HEARD YOU AND NEEDS YOUR HELP! Please drop in to one of the local unit meetings. Your negotiating team cannot be successful without you. Their strength comes from all of us standing together with them. Your WSNA Negotiation Team last met with SRH management on Tuesday, February 3rd, 2015. BUT….. Here’s what you REALLY need to know…. WAGES: The wages for RNs at SRH have seriously lagged behind those of nurses working at nearby WSNA Hospitals for some time now. During the last negotiations with WSNA in 2011, Management insisted on slashing the wages of the Clinic nurses. We told Management that a big wage reduction a bad idea and that it would drive quality nurses away from SRH and hinder SRH’s ability to hire good nurses. Management refused to listen, and Clinic nurses began to earn MUCH less than WSNA-represented nurses at nearby facilities. We believed then, and we believe now, that this is a misguided approach to cost-savings. WSNA has been proposing that SRH increase wages since day one of bargaining to correct the competitive wage disadvantage that Management has insisted upon. Management relented to WSNA’s pressure a bit by increasing wages in December, 2014, as negotiations dragged on. Even with this wage increase, the nursing wages at SRH still lag behind the market. For example, the vast majority of WSNA nurses at United General, currently earn 5%-7% more than acute care nurses at SRH, even with the December wage increase. Our modest proposal would help to lessen, not eliminate, the competitive wage disadvantage that SRH now faces. Our proposal ensures that nurses get a wage increase effective for the period from when the contract expired on June 1, 2014. Management is proposing no effective across-the-board wage increase for the time since the contract expired in June and when the December “4%” wage increase went into effect. By delaying the wage increase for 6 months, nurses only got the value of a 2% wage increase for that year. When St. Joseph’s Bellingham and United General Hospital recently settled their contracts after their expiration dates, Hospital leadership did the right thing and agreed to retroactive wage increases. SRH Management thinks differently and wants to take financial advantage of prolonged negotiations. Management is even going one bold step further and proposing to condition some of the nurses’ future wage increases on the Hospital meeting certain goals relating to: whether patients would recommend the Hospital; communication with nurses; responsiveness of hospital staff; and pain management. If the Hospital doesn’t meet these goals, nurses will not get their full potential wage increases. We can only assume that Management believes that SRH nurses have all the tools and staffing support for the Hospital to meet these goals, though one has to question how nursing can be held responsible for the responsiveness of other staff. Meanwhile, nurses tell us about staffing problems at SRH; and Management refuses agree to substantive, meaningful approaches to staffing problems. Management fails to recognize that nurses are professionally driven and, that given the proper tools and support, provide exemplary care. Area WSNA hospitals understand this and do not hold its nurses’ compensation hostage as part of a misguided pay practice. They guarantee full wage increases for the life of their contracts all the while facing similar Medicare and Medicaid reimbursement constraints as SRH. We fear that Management’s dangerous new approach to compensation will give SRH nurses yet another reason to look elsewhere for employment where they can earn a better wage and count on guaranteed wage increases that are higher than what Management is proposing. PER DIEM PREMIUM AND PREMIUM IN LIEU OF BENEFITS: Management continues to propose to cut the Per Diem premium and the premium in lieu of benefits. Currently, the premiums are 15%. Management is proposing to cut the premiums to 12%. All of the WSNA area hospitals pay their per diems a 15% premium. Moreover, Management made a completely new demand concerning per diem nurses on the 17th day of negotiations. To receive an entirely new demand so late in negotiations and during mediation is unusual and causes us to question Management’s good faith commitment to reaching an agreement. Management is now demanding that per diems not have the same flexibility they currently have regarding which days they are available to work. While we understand that individual nurses may have different points of view as to whether a per diem position is preferable to a FTE position with benefits, a couple of things are certain. Management’s proposal to slash per diem wages to below-market rates and to require per diem nurses to be available to work days that Management identifies will make per diem positions much less attractive to current and prospective nurses who will look elsewhere for higher pay and more flexibility. The result is that SRH risks losing a valuable resource and compounding its staffing problems. Moreover, we believe that Management’s proposal will make it cheaper for them to rely on per diem nurses rather FTE nurses with benefits and will encourage more skeletal staffing practices. Layoff, Restructure and Work Days. During the course of negotiations, Management also proposed that a 6-hour shift be considered a “normal” shift and that Management be allowed to change the start and end time of a nurse’s shift without the nurse’s consent. Management also proposed drastic changes to the layoff procedure which limit nurses’ options in the event of a layoff. We have fought off Management’s proposals regarding 6-hour shifts and changing start and end times, but Management is still proposing to reduce nurses’ options during a layoff. Moreover, Management has recently demanded that it be able to offer any nurse that it chooses to work an 8-hour, 10-hour or 12-hour shift without posting the position and letting other nurses have a chance to apply for the position. We think that this is unfair to all nurses. RETIREMENT AND HEALTH INSURANCE: Despite what you may infer from Management’s last update, Management is STILL proposing that it be permitted to try to reduce your retirement match during the life of the agreement, if it so desires. Management has rejected our proposal to preserve health and retirement benefits. STAFFING: We can only assume that, rather than meaningfully engaging WSNA on substantive staffing and resource solutions, Management believes that the solution to improving CMS benchmark scores is to have nurses work harder so that they can realize the full value of a potential wage increase without a corresponding commitment by Management to ensure that nurses have the proper staffing and resources to provide excellent care. We believe there is a better approach and have proposed staffing language so that the level of care can be improved. How does Management expect nurses to help them meet their goals when they refuse to agree to staff so that nurses provide safe patient care and receive meal and rest breaks? They can’t even bring themselves to commit to, at a minimum, the current staffing levels. So the next time you are working short-staffed, ask yourself what Management is doing for you to help them meet goals relating to nurses’ communication with patients and their families, pain management and responsiveness of hospital staff. After all, under Management’s proposal, your paycheck will depend on it. 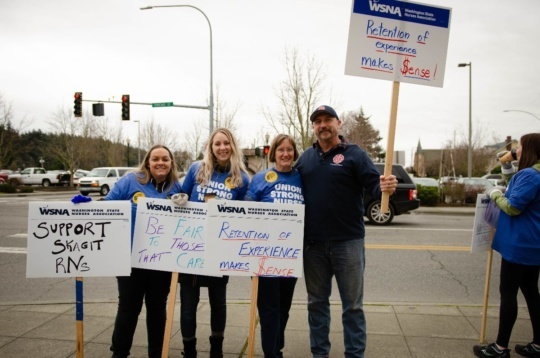 Your fellow nurses on your WSNA bargaining team have been attempting to get a fair contract with Skagit Regional Health over 16 bargaining sessions since March, 2014, several of which have been with the assistance of a mediator. Why has bargaining taken so long? Quite simply, SRH has made several proposals which, we believe, would negatively impact nurses’ working conditions, limit nurses’ options in the event of a layoff/restructure, reduce SRH’s ability to attract quality nurses, limit WSNA’s ability to advocate on behalf of nurses at SRH and create uncertainty around health insurance and retirement. Meanwhile, Management has rejected our proposals to ensure safe staffing, to secure fair wages and to preserve our current health insurance and retirement benefits. Wages. Management has proposed wage increases that we feel are not competitive with the market. Moreover, Management is proposing that some of nurses’ compensation be tied to the Value Based Purchasing scores set by the Centers for Medicare and Medicaid Services (CMS). Management wants nurses to ensure that it meets certain CMS standards, but doesn’t seem willing to give nurses the staffing resources they need to meet them, as evidenced by nurses having to demand that the Board do something immediately about the staffing issues at SRH. Finally, Management is proposing to reduce the Per Diem wage premium and the Premium in Lieu of Benefits from 15% to 10%. It makes no sense for SRH to be proposing to reduce the wages for some of its nurses when wages at SRH lag behind the market. Layoff, Restructure and Work Days. During the course of negotiations, Management also proposed that a 6-hour shift be considered a “normal” shift and that Management be allowed to change the start and end time of a nurse’s shift without the nurse’s consent. Management also proposed drastic changes to the layoff procedure which limit nurses’ options in the event of a layoff. We have fought off Management’s proposals regarding 6-hour shifts and changing start and end times, but Management is still proposing to reduce nurses’ options during a layoff. We have made counter proposals that would streamline the layoff process and change the way 10-hour or 12-hour shifts may be implemented, but Management still wants more. Your bargaining team recognizes that affordable, comprehensive health insurance and a predictable retirement plan are very important issues to the nurses at SRH. WSNA has made proposals designed to preserve the level of health and retirement benefits nurses currently receive. Management has not agreed to these proposals. WSNA’s Access to the Employer’s Premises and Its Ability to Represent Nurses at Grievance Meetings. Management has proposed to put additional burdens on WSNA before it can access the premises and has proposed to restrict WSNA’s ability to choose who can represent nurses during grievance hearings. We believe that these proposals would reduce WSNA’s ability to represent effectively the interests of nurses at SRH. Such proposals are especially troublesome in a climate where SRH seems increasingly hostile to the concerns of its nurses. Bereavement Leave. Not wanting to leave any stone unturned, Management is proposing to reduce bereavement leave for part-time nurses. We hope that this update gives you a better understanding of the challenges we have faced during these difficult negotiations. Now, more than ever, it’s important for the nurses at SRH to stand united. Unit Representatives from EVERY unit, ALL shifts. talk to your colleagues about how you wish things could be better? want to know what’s going on and how to best impact the outcome? Having someone from YOUR unit at this dinner is crucial! It’s up to you to talk to each other and confirm that one or more people from your unit are planning to attend! YOU have the power and responsibility to your colleagues and your patients to find a way to make a positive impact!